Siemens modeled an advanced microgrid at a university, running various scenarios that illustrate the complex way a sophisticated microgrid controller derives value. The microgrid that was modeled contains two combined heat and power (CHP) units, each with a 2 MW capacity; wind and solar generation, energy storage and controllable and fixed electric and thermal loads. Five scenarios were modeled. In the first two scenarios, the microgrid does not have an advanced controller. In Scenarios 3-5, where the microgrid is optimized with an advanced controller, new and sophisticated ways to derive value open up. The result is a two- to four-year ROI. A CHP plant operates within certain load thresholds. If the facility’s power demand falls below a certain level, the plant shuts off for safety reasons. “This shows how important it is to size these generators properly,” says Dino Ablakovic, Senior Solutions Architect at Siemens. The modeled facility has two 2-MW CHP plants. So hypothetically, if load is below 2 MW, one CHP plant operates. If load rises above 2 MW, the second plant kicks in. However, if the plant is optimized with an advanced controller, it quickly becomes apparent that it’s not that simple to get the most out of the facility’s resources. For example, a problem can occur in certain circumstances when heat and electric demand do not correspond—at least if the facility does not have an optimized controller. Consider a situation where the amount of heat needed requires operation of both plants, but the amount of electricity needed is much lower, below 2 MW. Under these circumstances, both CHP plants would automatically shut down since the electric load has fallen below the safety minimum. A power outage would result. “There is clearly a need for some type of advanced controller there,” Ablakovic explains. An optimized controller would avoid the outage by calculating the mix of resources to keep the facility running, taking into account load requirements, the price of electricity and the efficiency level of the CHP plants. Because of the many calculations the controller makes, the mix it decides upon at any given moment may even be somewhat counter intuitive. For example, imagine a winter day that creates a need for more heat than just one of the plants can supply. You may think the controller would solve the problem simply by turning on the second plant—especially since electricity prices on the grid happen to be high at this time, higher than the cost of electricity generated by the CHP. But the microgrid controller determines that it is more cost-effective to buy power from the grid than to run the second CHP plant. Why? CHP plants lose efficiency when they do not run to full capacity, Ablakovic says. Operating the second plant at partial capacity is not as cost-effective as buying the extra electricity from the grid, when CHP efficiency factors are taken into account. The CHP is most efficient if it is running at 2 MW—at that level it uses the least amount of fuel per kWh. 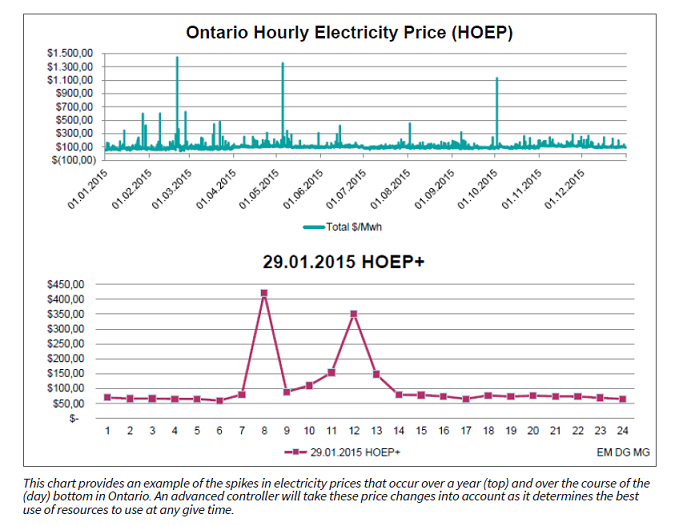 CHP is just one aspect of the microgrid that can be optimized to improve pricing and increase efficiency. “A microgrid has both fixed and flexible energy resources. The controller is able to optimize all of the flexible energy resources within a microgrid,” Ablakovic says. For example, a research lab may require a constant temperature, so is inflexible. A lecture hall may be flexible—the controller can reduce air conditioning in the room when it’s empty, increase it when it’s not. For this microgrid, hourly electricity pricing is available, so based on those numbers, the controller is able to fine tune in any given hour whether it is most cost-effective to use its own generation versus buy power from the grid. The controller automatically calculates a range of parameters to determine optimization. Some of these parameters change in real-time, which can cause a re-arranging of the facility’s energy configuration at any given point in time. The advanced microgrid controller also can help the facility manage electric tariffs. This is especially important because in some places a utility bases annual pricing on a facility’s peak load. If the rate threshold is say 2 MW, and the customer hits that peak only a once a year, it still is moved to the higher rate for the entire year. “If based on the historical data we see that there are only a few cases where this price level is reached, we try to isolate these cases, and through load optimization and energy shifting, see if we can avoid going over this price range,” he says. The controller also provides the ability to plan the best mix of future resources. It can run analytics based on various different forecasted gas and electric prices, along with decreases or increases in load. These forecasts can help in planning the optimal mix of resources for the future. For example, perhaps the plant plans to install a diesel generator for use when grid prices peak. If electricity prices are going to rise over the years, the analysis may show an increasing need for the diesel generator in the future years. That might suggest resizing the diesel generator in preparation for the later years. Or once downtime is considered for the maintenance of the diesel generator, it may prove optimal to install a second generator. The bottom line is that an advanced microgrid or distributed energy project has many resources at its disposal. When an advanced controller is used to manage the resources, it can derive value unavailable to simple generation-only projects. For example, a facility that uses CHP alone, or solar plus storage, without this advanced optimization and control, offers less flexibility and fewer pathways to maximum efficiency and best pricing. As the industry searches for ideal financing models, it is important to consider the abilities of an advanced controller and how it derives value for the microgrid. Microgrids and distributed energy projects achieve best ROI when their resources are deployed to their maximum. 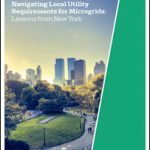 With an advanced microgrid controller, it is possible to get a microgrid’s value down to one number—down to a true ROI—that reflects the uniqueness of a microgrid’s abilities. With that calculation done, it becomes easier to design financing packages that are based on the true and clear value of a microgrid. A path to find the ‘killer app’ of microgrid financing, a model that will encourage more rapid adoption of microgrids, does exist. And it is the advanced microgrid controller that offers the signposts to get there. Read more about microgrid financing in our report, “How Microgrids Can Achieve Maximum Return on Investment (ROI): The Role of the Advanced Microgrid Controller,” downloadable at no cost, courtesy of Siemens. Why is Microgrid Financing Difficult? Inside an Optimized Microgrid: What is the Source of its Value? Excellent piece, the controller if coupled to a double inversion system could also run the CHP assets at lower than 60 hz, reducing fuel burn and time between maint intervals – as synchronisation would no longer be an issue. Further optimization could be achieved by dispatching via the controller to “play” in frequency and DR markets……. food for thought! Well written piece, thanks keep them coming.